Here's an easy way to organize, well, any number of things. 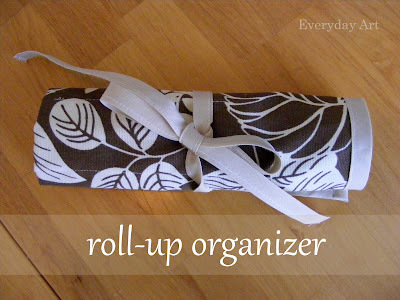 I made this little roll-up organizer for Jaime a while ago. I can't take all the credit though because it was totally my brother's idea and he asked me to do it. He bought her a whole set of wooden knitting needles and thought they needed a better home than the plastic bags and rubber bands they came in. So I created this long roll-up organizer. It's basically a long piece of fabric with a pocket that is divided into several small slots. I've been trying to think of what else this could be used for and the possibilities are pretty much endless. Here's what it looks like full of Jaime's wooden knitting needles. Want to make your own? It is so easy! 1. Decide your height, length, and pocket depth. 3. Layer your fabric pieces, wrong sides together. Sew bias tape along one long edge. Fold-up this edge to make you pocket. 4. With pocket folded in place, sew bias tape along 3 remaining raw edges. 5. Make slots by sewing vertical lines, spaced however you like, along the pocket. Sew long folded edges of bias tape together (so it can't come unfolded). Sew bias tape to the center outside edge of one of your organizer's short sides. Wow! Jaime is a lucky girl! I have a set of small scissors with different blade types just sitting in my drawer. They would be so happy with a home like this. Hey, I'm Jaime =) Sadly, not that Jaime though! Great job on this organizer! I have lots of different ideas for what could go in it. Cute! I was just thinking I needed something like this for traveling with my jewelry, and now I know how to make one!